The last few Cardratings.com articles have dealt with important issues: credit card protection and security, two things that almost everyone with a credit card thinks about at one time or another. This month, another topic on secure credit card use: online shopping. If you've ever purchased anything on the Internet, you are probably a big fan of the ease and efficiency of the purchase, along with the "delivered to your door" aspect. Despite the recent downfall of many online companies, shopping online remains very popular. In fact, eMarketer.com, a research firm that focuses on online trends, predicts online business to total $65.9 billion in the year 2001, a 57% increase from 2000. Stories of high-tech hackers breaking into company databases on the Internet to steal customer information (such as credit card numbers) stop many people from making online purchases. Although these types of problems don't happen often, there is an ever-present fear among consumers that the wrong person may get hold of their credit card number or other private information. Because of booming e-commerce and the love affair with the Internet, there is much at stake for credit card companies should these problems or fears get out of hand. As you might expect, companies are working quickly with new technology to stop the problems and calm the fears of their customers. Their solution? Disposable or temporary credit card transaction numbers. First introduced by American Express (American Express is a CardRatings.com advertiser) in September of 2000, a disposable transaction number is a one-time number assigned to a credit card customer that enables them to make a purchase online. American Express touts its "Private Payments" program as a system that gives their consumers peace of mind by making their online shopping experience as secure as possible. Private Payments assigns unique random numbers that are linked to a consumer's actual card account, but the numbers are only temporary and do not reveal any private information. This temporary credit card number is good for one purchase only, meaning that it does no good for someone to swipe that number because they won't be able to use it after the initial purchase. Private Payments is free to American Express Consumer Cardmembers and Small Business Cardmembers and can be used at all web sites that accept the American Express Card. Update! As of May 2004, American Express is no longer offering the "Private Payments" program. Discover Card is another company that has ventured into this realm by offering their Deskshop Virtual Credit Card. Deskshop differs from Private Payments in that it allows the user to make multiple purchases from the same online store. For example, each single-use card number is unique to an online store that you visit and will not be valid at any other store. In addition, you may use the same number for recurring charges such as monthly bills that you elect to pay online. Although disposable credit card numbers are not available with every company yet, do not be surprised if these types of programs are offered by most major credit card companies soon. Update! Citibank is now offering a Virtual Account Numbers program and MBNA has a similar program called ShopSafe. Regardless of whether you take advantage of disposable card numbers , you should always protect yourself with safe Internet shopping practices. You can find some tips for safe online credit card use on the Fraudbureau.com web site. Also, be sure to visit the Scams and Internet Security section of our site for additional resources. But aren't consumers already protected against credit card fraud? Recent CardRatings.com articles have reiterated that the maximum liability for credit card holders in the case of loss or theft of their credit cards is $50 (many card issuers now even have "zero liability policies" in place). So why are programs such as Private Payments needed if consumers are already protected? The main reason is to alleviate hassle. 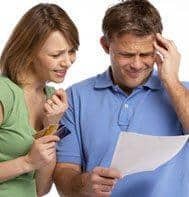 The business of contacting your credit card company and explaining the situation, filling out the necessary forms and making claims can be cumbersome. It makes more sense to be protected from fraud in the first place rather than after it has taken place. One more reason? To protect merchants who do business online. Because of chargebacks from fraudulent purchases, online fraud costs merchants millions of dollars overall each year. One more note regarding protection with online shopping. Although "disposable" credit card numbers are safe to use in most cases, companies do recommend that some online purchases be made with your actual card number. These occasions include purchases that require the buyer to present their credit card in order to receive their purchase, such as the purchase of airline and movie tickets.